Nurglings and Beasts of Nurgle serve almost no tactical purpose. They are included in a force purely for entertainment value. In the 4th Chaos Codex they aren't really an option, you could field them as Spawn. 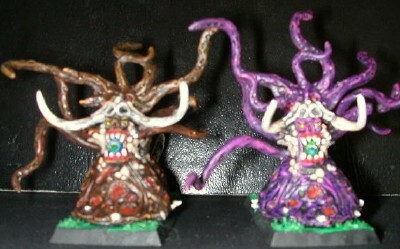 I intended to wait paitently for rules for these models and I find Nurglings so amusing I intend to paint up at least 8 more stands in anticipation of them actually being useable again sometime in 2008. I call my Nurglings George Jrs because I call my Great Unclean One "George". George Foreman has multiple sons named George Jr. My GUO is like George Foreman thus my Nurglings are the George Jrs. I spent entirely too much time painting these models. Most people just dry brush them. I highlighted every single gobulat of puss. Each stand is painted differently. I used a mix of old style "humorous" and the then new style "mean" Nurgling. I prefer the old style, I generally prefer the old anything when it comes to GW. I'd almost forgotten I gave every Nurgling beady yellow eyes. Although not a Troop choice, you can still field them in 40K as spawn but they are due for a rebasing. Although they look cool they are combat ineffective especially for their point costs. The models are a pain to assemble and their best use in the game is to take a lascannon for the team. I have a green one called Sluggie, a brown one called Slimey, and a purple one called Esmeralda. Esmeralda's a girl.